One of the greatest ironies about the Affordable Care Act was that it whiffed on providing affordable health care. Any idiot can expand Medicaid without paying for it. It takes a savvy group of politicians to bend the cost curve in a sustainable way. The key to sustainability was to focus on the unsubsidized health insurance cost. The Affordable Care Act supporters did believe in the importance of affordable health care. In fact, they had a very specific goal for affordable health insurance. When you go to healthcare.gov it says that if the lowest cost Bronze-level plan available to you through the Marketplace is more than 8.13% of your household income then your health insurance is unaffordable. This implies that since the Marketplace subsidies cease at 400% of the federal poverty limit(FPL), the lowest cost Bronze-level plan should cost no more than 8.13% of the 400% FPL. As an example for a two person household, the lowest Bronze-level plan should cost no more than .0813 times $64,080 or $5,209.70 per year. This rate is not unreasonable. A couple of years ago my grandfathered health insurance plan cost that much. You hit what you aim at, and if you aim at nothing you will hit it every time. The canary in the coal mine is those healthy people purchasing unsubsidized health insurance and yet this is the group that is most likely to be taken advantage of. When I look at five years of 13% increases in my health insurance premium, I feel like my insurance company took advantage of my situation. When I look at the $12,696 premium from the Marketplace, I feel like the government and the insurance companies conspired to take advantage of my situation. The Urban Institute has offered some ideas on fixing the Affordable Care Act such as a premium cap at 8.50% of income and an individual mandate modeled after Medicare. The premium cap at 8.50% of all income is a step in the right direction but I prefer 8.13% of the 400% FPL. Since I do not think the Affordable Care Act supporters and insurance companies have been honest with me over the last five years, I think the only way we can keep these folks honest is to have no mandate. Frankly, I have not found any Medicare participants who like their mandate so why push this headache on the rest of the population? The most pragmatic solution for me is to self-insure even though healthy, unsubsidized people are the foundation that allows us to offer affordable health insurance to everyone. If the Affordable Care Act had any redeeming value to the middle class, I do not see it in this graph. We did not get more affordable health care. Convince someone in government to allow me to keep my grandfathered health insurance for another year. Not carry any health insurance. Get health insurance from the exchange. No one should be surprised that health insurance from the exchange is not affordable and the only happy customers are those getting subsidies. According to the HealthCare.gov Exemptions Screener, I should be paying no more than 8% of my income on health insurance. For a couple earning $63,721(400% of the federal poverty level) this is only $425 a month. Last November I looked up the lowest cost bronze plan and it was going to cost me $979 a month or $11,748 a year. For a couple earning $63,721, health insurance would have taken 18.4% of their income. According to HealthCare.gov a couple like me would have to earn $146,850 a year before a health insurance policy from the exchange became “affordable”. Only the subsidized, wealthy, chronically ill, or naive would choose health insurance from the exchange. With health insurance from the exchange costing $11,748 or more per year in 2016, self-insurance becomes a financially attractive option. As a healthy family who has gone without health insurance in the past(1998-2008) and who is exempt from the individual mandate because I cannot purchase “affordable health coverage” from the exchange, the biggest financial risk is a hospitalization that costs more than $12,000. If you have the discipline to have a large enough emergency fund to cover future health costs then this is an attractive, financially efficient second choice. $12,000 per year will buy a lot of health care especially if you are a savvy buyer. If I could get a catastrophic care policy priced at 4% of my income this would be my number one choice since it would be the best of both worlds, encouraging both healthy living and saving for medical expenses. My first choice is to keep my existing health insurance and to convince the government to reinstate HRA’s for companies with less than 50 employees. My health insurance plan is almost as affordable as the subsidized insurance from the exchanges. As a person who has not filed an insurance claim in the last 15 years, I am by definition the perfect health insurance customer. It is probably in the best interest of the insurance industry to do whatever it takes to keep me as a loyal customer. Although my employer gave me a $500 a month bonus this year to pay for my health insurance I would be financially better off if that money went into a HRA. Taxing a health care bonus is just plain stupid. Once again it is in the best interest of the insurance industry to bring back the HRA before I get comfortable going without health insurance. One of the major problems I have with fixing the Affordable Care Act is that we are being led by a bunch of morons. Bob Laszewski said “about everybody believed about all of the states would establish their own exchanges” and what do most of the states do? We go from every state wants to set up an exchange to almost no state wants to set up their exchange. Doesn’t anyone see this as a major problem with making health care simpler, better, and more cost efficient? So these same folks have now focused their attention to preserving subsidies rather than making our health care system work better. Unfortunately preserving subsidies turned healthcare.gov into an unnecessarily complex, cost shifting system that requires an unknown number of IRS minions to enforce. Okay, we screwed up. Now is the time to fix it before we turn our health care system into a VA system on steroids. What would it take to make state exchanges work? State exchanges would require a simpler system that minimized development and ongoing costs. Fortunately for us states have limited budgets so complicated systems that do not add value to the customer is not an option. Streamlining or replacing the subsidy system with a simpler cost shifting system that could be implemented in a state exchange without much difficulty would be the first priority. It sounds simple. Instead we seem to be locked into a complex national health exchange we did not want and will most likely fail. My own observation, having closely watched the original Obamacare Congressional debate, is that this issue never came up because about everybody believed about all of the states would establish their own exchange. I think it is fair to say about everyone also believed a few states would not establish their own exchanges. Smaller states, for example, might opt out because they just didn’t have the scale needed to make the program work. I don’t recall a single member of Congress, Republican or Democrat, who believed that if this happened those states would lose their subsidies. Can We Start Talking About Gutting The Affordable Care Act? I was reading John Graham’s post, What is To Be Done with Health Insurance Exchanges, Post-Obamacare?, and could not resist saying the federal health insurance exchange is a lousy tool to fix these health care problems. Here are my reasons. 1. The cost of health care for people with high cost, pre-existing conditions is being spread across a fairly small group of people buying their health insurance via the exchanges. If health care for people with pre-existing conditions is society’s responsibility than the cost should be spread over a much larger group of people. Until we solve the problem with paying for pre-existing condition health care in a more equitable manner, health insurance exchanges will be plagued with high risk premiums and are likely to fail. 2. Health exchanges in general are a lousy way to subsidize health insurance for people earning less than 400% FPL if you want to control health care costs. This is the same problem faced by expanding Medicaid. The Oregon Medicaid experiment leads us to speculate that this group of people will consume more health care services without an improvement in health care outcomes. A health insurance credit is probably a step in the right direction of simplifying the subsidy system while providing subsidies and cost control incentives. 3. With the market distortions from pre-existing conditions and subsidies and overall incompetence in the roll-out, it is hard to imagine health insurance exchanges as an adequate substitute for the fair, unbiased health insurance market place we expected in 2013. As a person who has purchased health insurance from eHealthinsurance.com in the past, I have to assign blame for the overall incompetence of healthcare.gov to politics. The ACA made purchasing health insurance unnecessarily complicated. When you combine the public’s unfavorable view of the federal health exchange with its history of being a political football, this would be a good time to look at a replacement that involves less federal government and political partisanship. The original ACA plan relied on state exchanges and we should go back there in a modified form. My personal favorite idea is to simplify the enrollment process and replace the federal exchange with state exchanges run in cooperation with insurance companies and insurance marketers. eHealthinsurance.com and other companies like them already had the infrastructure in place. You can call this the Halbig solution with adults in the room. If we cannot get rid of the amateurs in the federal government we should at least minimize their damage. Things That Make Me Go Hmm… Are Health Exchanges Medicaid For The Middle Class? I have been thinking about this HHS quote I saw on a Zane Benefits blog post today. It got me to thinking. Are health exchanges sustainable if only 13% are paying the full price for health insurance? If health exchanges are not sustainable without government subsidies then they begin to look like Medicaid for the middle class. Does this mean that we are gradually turning our health care system into one modeled after Medicaid? I want the old health care system! It was not only cheaper but it provided me with better health care options than this new, improved one. According to the U.S. Department of Health & Human Services (HHS), 87 percent who purchased health plans through Healthcare.gov in 2014 qualified for premium tax credits, with the tax credit covering 76 percent of the premium cost. What Was The Reason For States To Set Up Exchanges? I just finished reading Nicholas Bagley’s article, “What does the Gruber video tell us about Halbig?”, and Aaron Carroll’s article, “My one comment on Gruber and Halbig”, this morning when it struck me that there was a lot of circumstantial evidence that the federal government fully expected that they could convince states to set up exchanges. In 2010 I read some posts on The Incidental Economist website that trumpeted the healthcare.gov site so I checked it out. I found their insurance finder a “complete waste of time”. Obviously the writers at The Incidental Economist had never visited the site. 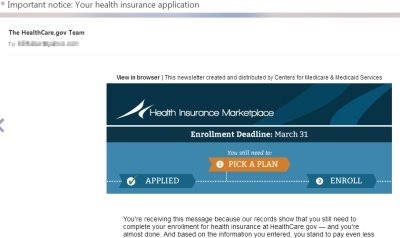 The healthcare.gov site was a poorly designed information site that was completely unprepared for becoming a retail site for insurance. Whoever was running the healthcare.gov site thought that state exchanges were going to take the brunt of the load. Over the next couple of years there was lots of complaints that no one anticipated that the federal site would be the insurance exchange for 36 states. Everybody was saying the same thing, states were supposed to setup insurance exchanges. There is nothing that screams louder that the Affordable Care Act plan was for states to set up exchanges than the botched roll out of healthcare.gov. So if we assume that the plan all along was for states to set up exchanges and that subsidies were not going to be used as leverage then how was the federal government planning to convince states to set up insurance exchanges? States would have to set up an organization kind of like the one they use to administer Medicaid and for most states the cost of administering Medicaid is a real pain in the budget. In the rough and tumble world of state politics and budget deficits what could the federal government offer states to offset the risk? Setting up a state exchange could be costly and embarrassing fiasco as Oregon found out. It almost looks like a Republican conspiracy to make traditional “blue” states look bad except without Republicans. What issue was big enough that Democrats would throw fellow Democrats under the bus? Until someone can explain to me the political and financial incentives for setting up state exchanges rather than using the federal exchange, I have to assume that the Affordable Care Act supporters decided to change course in mid-stream and it was part of their strategy. The only selling point for setting up state exchanges that had enough urgency was the subsidies. This was not a drafting error and I suspect there were Affordable Care Act supporters who questioned the wisdom of this strategy. To them the idea of restricting subsidies to the state exchanges was always a bluff so without much fanfare they reverted to Plan B even though the law said otherwise and even more reluctantly started planning for a bigger healthcare.gov. Solely for political reasons they chose to save the Affordable Care Act by offering subsidies through the federal exchange and hoped to whether the storm. Now that the enrollment period is closed it is probably a good time to start looking back at the mistakes made. Since HealthCare.gov is attempting to act like a private business it is fair to use compare their practices to those of existing businesses. As a prospective customer and IT guy I have to say I was dismayed on many different levels. Here are some of my complaints. The website planning, execution, and testing was a total disaster. It took me a couple of weeks before the front end was fixed enough to allow me to log in. They should have finished testing the easy part, the front end, at least 90 days prior to the roll out. I first used www.healthcare.gov in 2010. There is nothing new or novel about the front end. There was no excuse for the front end not to be ready on October 1st. The application process was unnecessarily complicated. They should have copied the code and work flow where appropriate from some else’s web site such as www.ehealthinsurance.com or www.anthem.com. Maybe they should have delegated income verification to the insurance companies. The site and back end specifications should have been locked down 90 to 180 days in advance of the roll out. The backend should have been tested by the time the web site went online. Management reports should have been available on October 1st. They should have enlisted www.ehealthinsurance.com and the others to sell subsidized health insurance on October 1st for redundancy. They should have been honest about the benefits and drawbacks of the new health insurance plans compared to the old plans. They should have enlisted someone to do a non-partisan price and product comparison with last year’s insurance products. Most of the comparisons I read sounded more like political propaganda rather than Consumer Reports. I ended doing my own comparison and as a result was not happy. Now they are stuck trying to sell to a customer who is not happy and doesn’t trust you. Good luck with that strategy! They should have used a proactive approach towards explaining the drawbacks of narrow market insurance plans and how it affects doctor choice. This should not have been something we stumble upon after the web site is up and running. We should have been talking about high or increased deductibles before October 1st. They should have used a “go slow” approach towards canceling existing heath insurance plans. If they are willing to grandfather my current health insurance plan for another two years, they should have said this in October 2013. The website should have proudly demonstrated how HealthCare.gov respects the customer’s privacy and security concerns. The HealthCare.gov did almost nothing to alleviate customer security concerns. It was as if they did not care. The Administration’s marketing plan was questionable at best. It is very hard to build customer interest and satisfaction with the Affordable Care Act when a significantly large group of people are mad that they are being ripped off. You have to wonder about marketing strategy when an integral part of the plan appears to be to ignore those customers. I will reserve my judgment on the success of the Between the Ferns and other youth oriented marketing until we see how many young customers are still paying their health insurance premium six months down the road. Over the last 11 days I received at least eight emails very similar to the email above but with different subject lines. Since my existing health insurance is grandfathered I chose to ignore the emails but the tone sounded more like nagging rather than trying to be helpful. Sending nagging emails once a day was not helpful and I suspect that some people clicked the spam button to get rid of them. As a person familiar with email marketing this is a major faux pas. How Do You Tell healthcare.gov You Don’t Love Them Anymore? what I have when I buy auto insurance! I often wondered whether I was buying or marrying my health insurance plan. What I Learned About Cybercrime Last Week… Beware of the Air Conditioner Man! Although it was not a surprising result KrebsonSecurity reported that the hackers who broke into Target used the network credentials of the HVAC contractor. Like most retailers when we see the HVAC contractor or other maintenance people in the building, we get out of the way and let them do their job with a minimum of supervision. I can understand in this interconnected world that the HVAC contractor and Target want to know immediately if the HVAC equipment has malfunctioned. I am surprised that the HVAC equipment evidently used the same network as the POS terminals. As a person who fills out the annual PCI questionnaire there are a lot of questions about segregating and securing credit card data. Giving network credentials to the HVAC contractor kind of defeats the goal of segregating the credit card data from non-essential personnel. It does make you wonder what the security folks at www.healthcare.gov are doing. As far as I can tell the web site security questions are still unanswered. It make me wonder what they have done and what still needs to be completed. Is there anything the www.healthcare.gov security folks can learn from the Target incident? If you believe that the exchange should be operating more like a business than an inept government program, this would be a good time to for the Affordable Care Act management to be more proactive and tell the public how secure their personal data is at www.healthcare.gov. Hmm… It’s beginning to look like another missed opportunity.